To nominate anyone for the employee of the month just to download form and fill it out and send it to Leo, Director before the 10th of the month. Click here to download form. 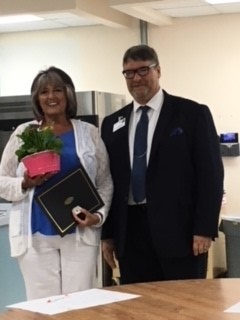 March 2019 Employee of the Month Recipient Congratulations to Rita Lewis. Rita was recognized as being a very friendly and helpful co-worker. She is a dedicated employee who goes above and beyond. Thank you for your years of service. 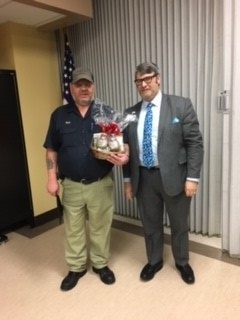 February 2019 Employee of the Month Recipient Congratulations to Chip McArthur. Chip came to work for the Health Center the later part of December, and what a blessing he has been. As we approached the AAAHC survey he has gone above and beyond to make sure that this building was prepared. He has been proactive in dealing with the winter weather which has been somewhat overwhelming for us all. His response time to staff is incredible, something we haven’t had here for a long time. He is pleasant, knowledgeable, and goes the extra mile to get things done for whoever is in need. We can’t say enough about how he has made everyone's job easier. 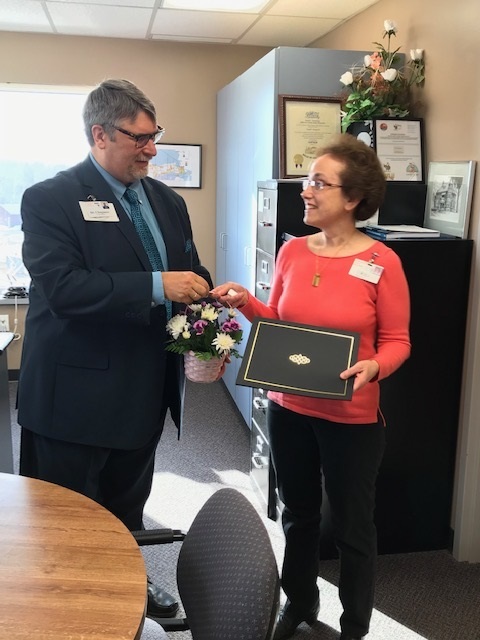 Having someone to turn to, that you know will get the job done properly and promptly is HUGE. .
January 2019 Employee of the Month Recipient Congratulations to Debbie Sirk for being named the January Employee of the Month Debbie's knowledge and dedication to CARF, was invaluable as the Behavioral Health Dept. prepared for the recent CARF survey. Her efforts (along with all the BH staff) were rewarded with a 3 year Accreditation. Congratulations . 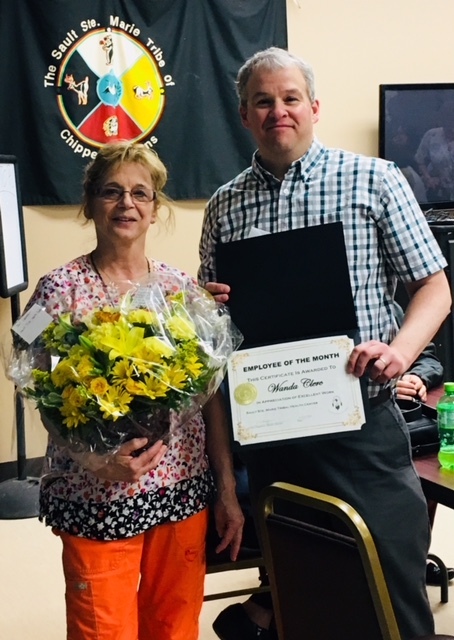 2018 Employee of the Year Recipient Congratulations to Wendy Snyder, Billing Clerk, Wendy Snyder was Sault Tribe Health Division¹s April, 2018 employee of the month. Wendy has been with the Health Division 21 years and works at the St. Ignace health center. Thank you, Wendy, for going above and beyond. 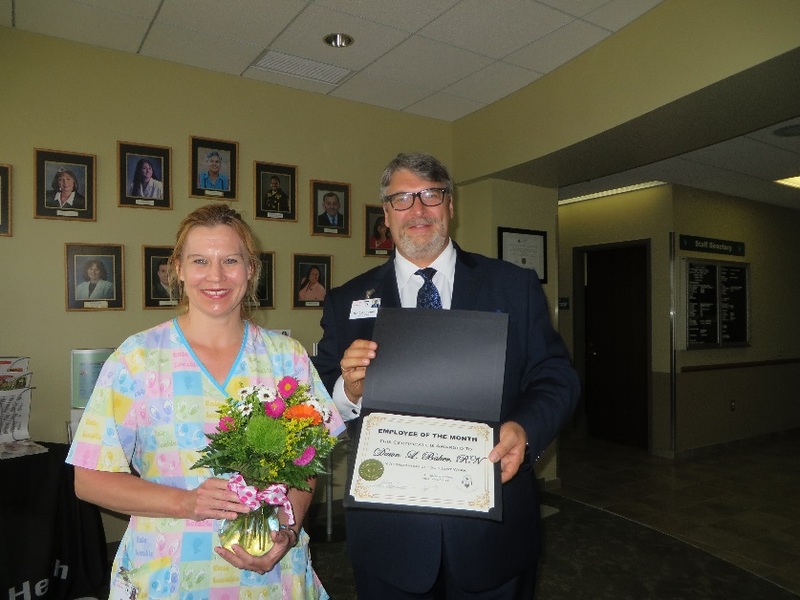 Wendy is pictured with Health Director Leo Chugunov. 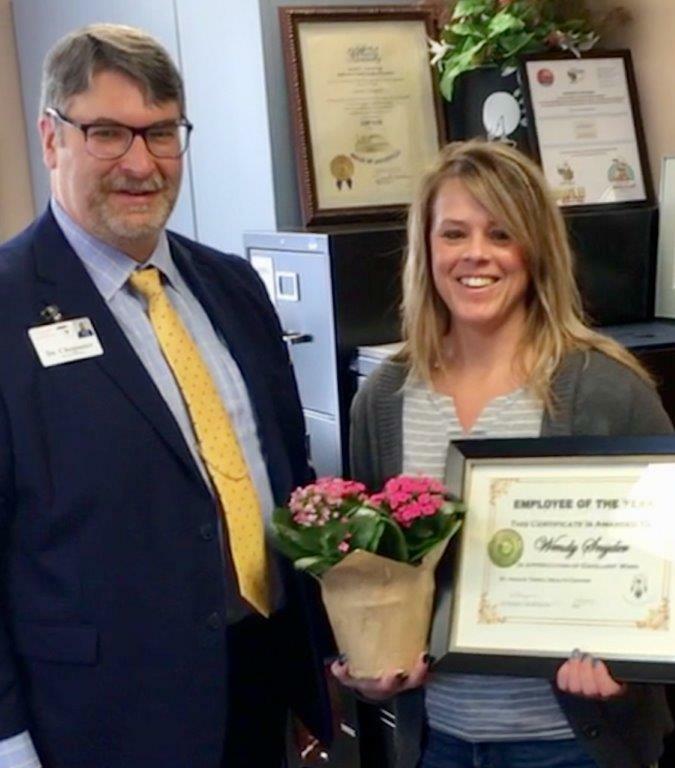 December 2018 Employee of the Month Recipient Congratulations to Kristy Hill, Registered Dietician, and Certified Diabetic Educator, she has been named as December 2018 Employee of the Month. Kristy is working under the Special Diabetes in Indian Country or SDPI grant in the Community Health Department at the Sault Ste. Marie Tribal Health Center. Kristy graduated from Northern Michigan University with a BS in Nutrition in 2000. She accepted a RD position with Sault Tribe Community Health in March of 2001. Kristy and husband John have 3 children and live on a dairy farm in Brimley, Michigan. 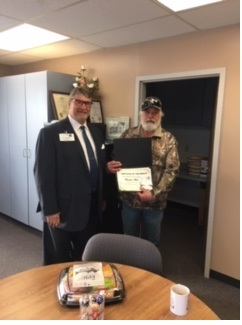 November 2018 Employee of the Month Recipient Congratulations to Rick Corbiere. Rick was chosen due to his dedication for the past 6 weeks of returning after hours, long after going home for the day, to lock up the building since we are extremely short handed. His going above and beyond has been recognized and greatly appreciated. Rick was presented a lovely gift basket full of chocolate goodies. 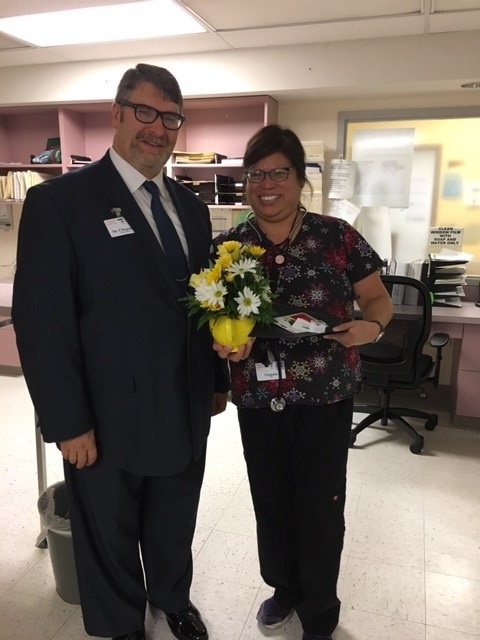 October 2018 Employee of the Month Recipient Congratulations to Virginia Manitowabi. Virginia has been a real asset to the nursing department as she is willing to pitch in where ever needed . 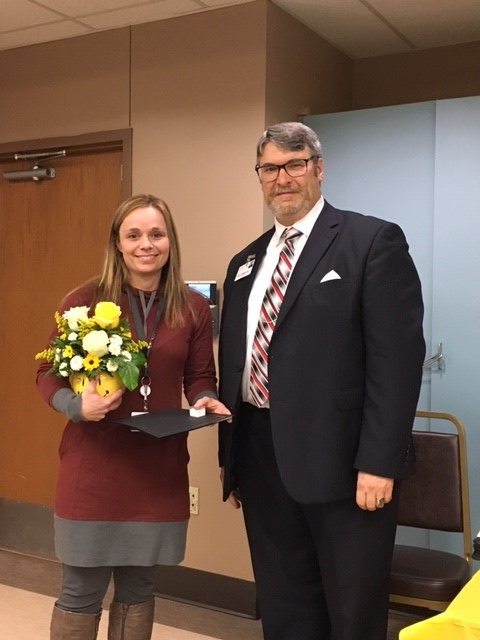 September 2018 Employee of the Month Recipient Congratulations to Nicole Krzyzanski. Nicole is Administrative Assistant in Sault Tribe Health Center in Manistique. 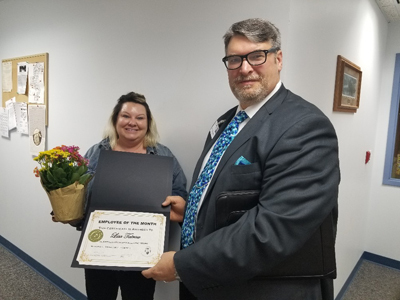 Thank you Nicole for all you do..
August 2018 Employee of the Month Recipient Congratulations to Lisa Tatrow, Mental Health Therapist, located at our Manistique Clinic for being chosen as the August Employee of the Month. 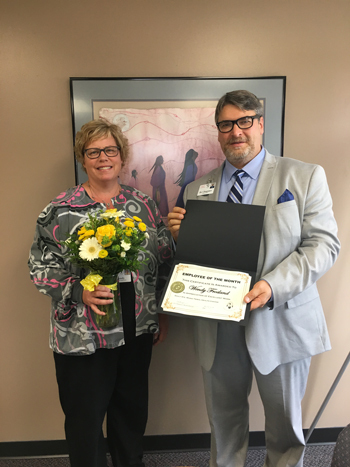 July 2018 Employee of the Month Recipient Wendy A Frosland, RN, Community Health nurse at the St.Ignace tribal health and human service clinic. Wendy has been working as a community health nurse for 12 years at the St.Ignace site. Born and Raised in St.Ignace and has been working in the health care field since 1989. Wendy loves working with the her clients and the community. She does home visits, flu clinics, disease process education and more. Susan always went above and beyond to be helpful to all of the people who she came in contact with. We will truly miss her, but wish her nothing but the best in her retirement. 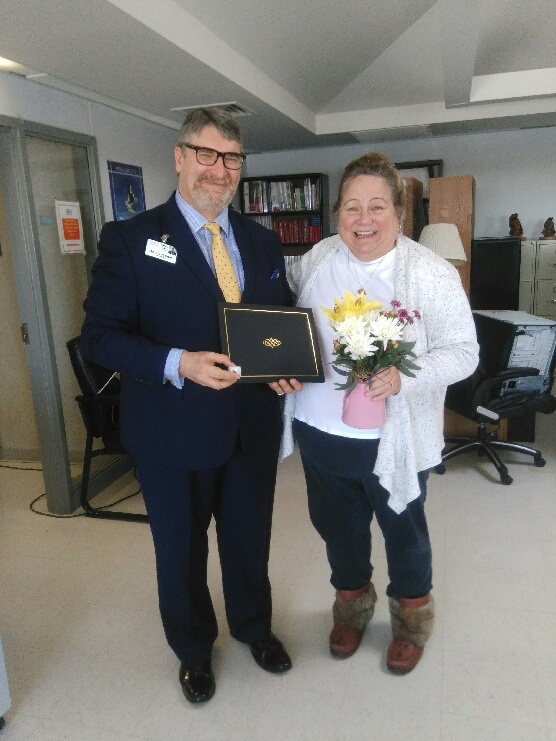 Billing Clerk, Wendy Snyder is Sault Tribe Health Division¹s April, 2018 employee of the month. Wendy has been with the Health Division 21 years and works at the St. Ignace health center. Thank you, Wendy, for going above and beyond. Wendy is pictured above with Health Director Leo Chugunov. 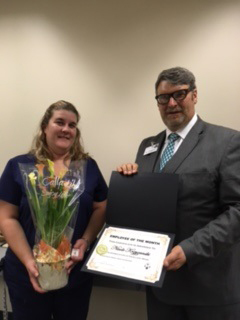 Wanda Clerc, Housekeeper, pictured with Joel Lumsden, Assistant Health Director - 9 Years of Service. Your dedication to the cleanliness of our health center is greatly appreciated. 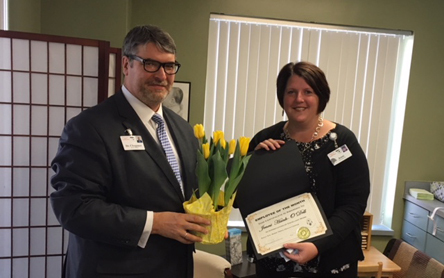 February Employee of the Month, Jenni O'Dell pictured with Leo Chugunov, Health Director - 17 Years of Service as Community Health Nurse Supervisor. Your dedication to our tribal members and willingness to go above and beyond is truly treasured. Pictured is Leo Chugunov, Health Director and the January Recipient Erica Moses, Pharmacy Technician - Pharmacy Technician Erica Moses is Sault Tribe Health Division¹s January 2018 employee of the month. 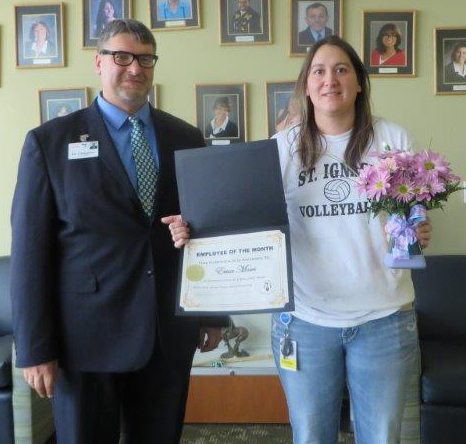 Erica has been with the Health Division 14 years and works at the St. Ignace health center. Thank you, Erica, for going above and beyond.